U. TORONTO (CAN) — Scientists have unearthed a colossal human sculpture and ornately decorated column base at an excavation site in Turkey. Both pieces are from a monumental gate complex that provided access to the upper citadel of Kunulua, capital of the Neo-Hittite Kingdom of Patina (ca. 1000-738 BC). 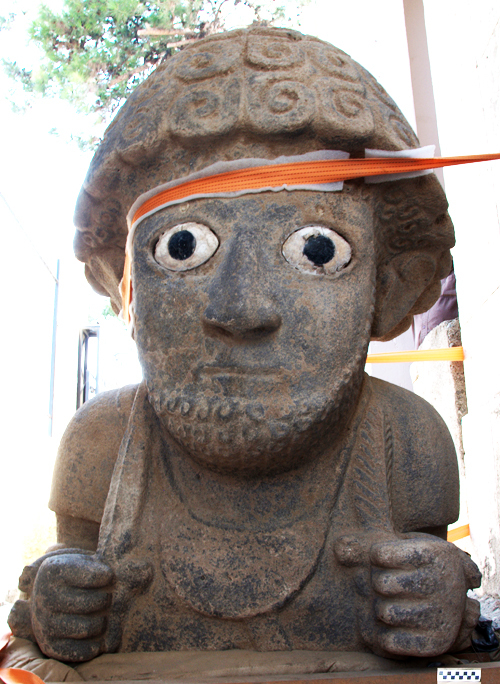 “These newly discovered Tayinat sculptures are the product of a vibrant local Neo-Hittite sculptural tradition,” says Tim Harrison, a professor of near eastern archaeology at the University of Toronto and director of the Tayinat Archaeological Project (TAP). The head and torso of the human figure, intact to just above its waist, stands approximately 1.5 meters (5 feet) in height, suggesting a total body length of 3.5 to four meters (11.5 to 13 feet). The figure’s face is bearded, with beautifully preserved inlaid eyes made of white and black stone, and its hair has been coiffed in an elaborate series of curls aligned in linear rows. Both arms are extended forward from the elbow, each with two arm bracelets decorated with lion heads. The figure’s right hand holds a spear, and in its left is a shaft of wheat. A crescent-shaped pectoral adorns its chest. A lengthy Hieroglyphic Luwian inscription, carved in raised relief across its back, records the campaigns and accomplishments of Suppiluliuma, likely the same Patinean king who faced a Neo-Assyrian onslaught of Shalmaneser III as part of a Syrian-Hittite coalition in 858 BC. The second sculpture is a large semi-circular column base, approximately one meter in height (3.3 feet) and 90 centimeters (2.95 feet) in diameter, lying on its side next to the human figure. A winged bull is carved on the front of the column, and it is flanked by a sphinx on its left. The right side of the column is flat and undecorated, an indication that it originally stood against a wall. “The two pieces appear to have been ritually buried in the paved stone surface of the central passageway through the Tayinat gate complex,” says Harrison. The complex would have provided a monumental ceremonial approach to the upper citadel of the royal city. Tayinat, a large low-lying mound, is located 35 kilometers (21.75 miles) east of Antakya (ancient Antioch) along the Antakya-Aleppo road. The presence of colossal human statues, often astride lions or sphinxes, in the citadel gateways of the Neo-Hittite royal cities of Iron Age Syro-Anatolia continued a Bronze Age Hittite tradition that accentuated their symbolic role as boundary zones, and the role of the king as the divinely appointed guardian or gatekeeper of the community. By the ninth and eighth centuries BC, these elaborately decorated gateways, with their ornately carved reliefs, had come to serve as dynastic parades, legitimizing the power of the ruling elite. The gate reliefs also formed linear narratives, guiding their audiences between the human and divine realms, with the king serving as the link between the two worlds. The Tayinat gate complex appears to have been destroyed following the Assyrian conquest of the region in 738 BC, when the area was paved over and converted into the central courtyard of an Assyrian sacred precinct. 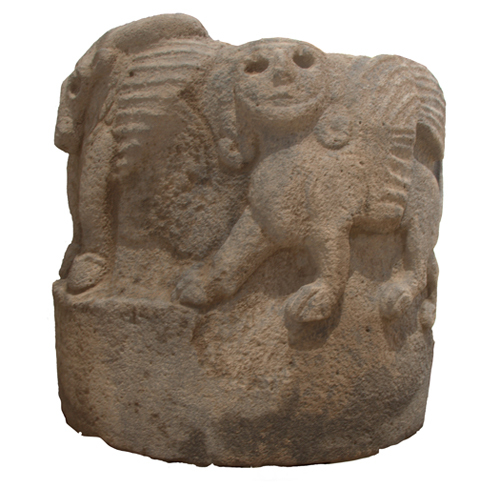 These smashed and deposited monumental sculptures also include a magnificently carved lion that was discovered last year and Hieroglyphic Luwian-inscribed stelae (stone slabs or pillars used for commemoratives purposes). Together these finds hint of an earlier Neo-Hittite complex that might have once faced the gateway approach. Scholars have long speculated that the reference to Calno, identified as one of the “kingdoms of the idols” in Isaiah’s oracle against Assyria (Isaiah 10:9-10), alludes to the Assyrian devastation of Kunulua (i.e., Tayinat). The destruction of the Luwian monuments and conversion of the area into an Assyrian religious complex may represent the physical manifestation of this historic event, subsequently memorialized in Isaiah’s oracle. TAP is an international project, involving researchers from a dozen countries, and more than 20 universities and research institutes. It operates in close collaboration with the Ministry of Culture of Turkey, and provides research opportunities and training for both graduate and undergraduate students. The 2012 season was funded by the Social Sciences and Humanities Research Council of Canada, the J.M Kaplan Fund, which provided support for the creation of a conservation program, and the University of Toronto.